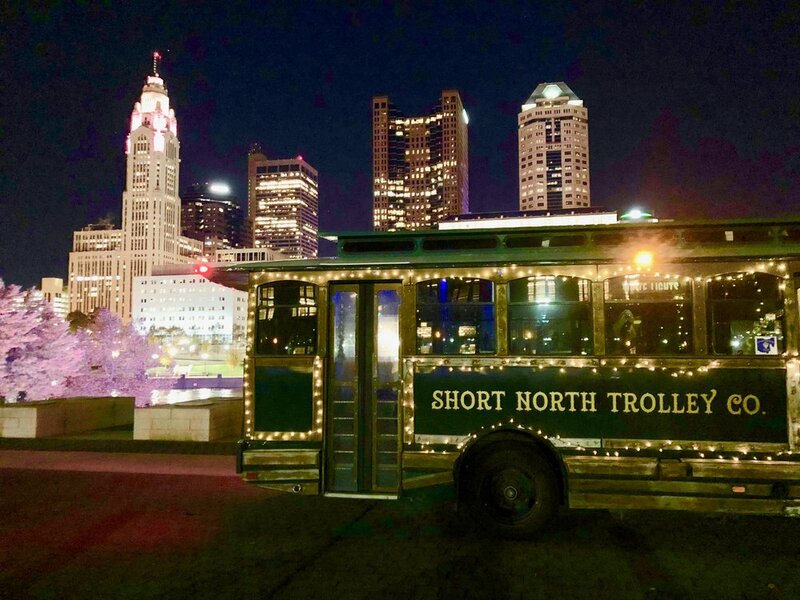 2-Hour Events Designed by Short North Trolley Co. This cruise runs 7-days a week from December 1st - January 5th. Please arrive at least 15 minutes prior to the start of the cruise. If you arrive early, do not bring alcohol inside of the meeting location. Public cruise tickets range from $37-$45. A minimum of 8 people is needed in order to launch public cruises. Private Trolleys for 15-people range from $540-$660. Additional passengers may be added for $40/person. 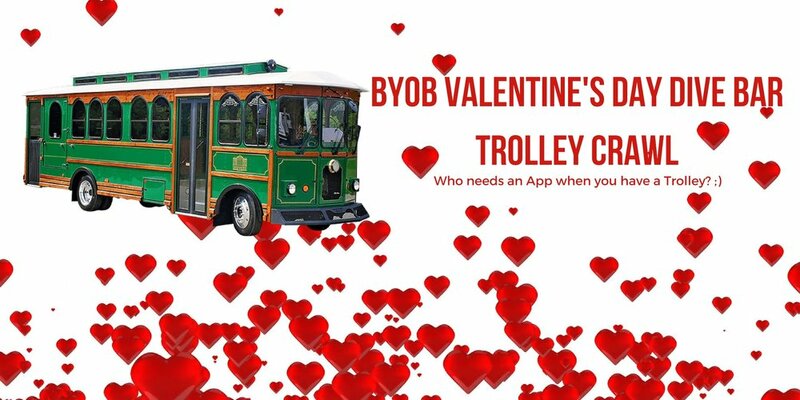 For large groups (12+) we suggest booking a private Trolley. This cruise runs Saturday and Sunday from December 1st-January 5th. Public cruise tickets range from $28-$32. A minimum of 8 people is needed in order to launch public cruises. Private Trolleys for 15-people range from $379-$449. Additional passengers may be added for $20/person. This cruise runs 7-days a week from February 4th - February 17th. Public cruise tickets range from $23-$28. A minimum of 8 people is needed in order to launch public cruises. Private Trolleys for 15-people range from $275-$325. Additional passengers may be added for $20/person. This cruise runs from May 1st - May 8th. This cruise runs from March 11th - March 17th. This cruise runs 7-days a week from January through mid-November. Public cruise tickets range from $23-$32. A minimum of 8 people is needed in order to launch public cruises. Private Trolleys for 15-people range from $275-$449. Additional passengers may be added for $20/person. This cruise runs 7-days a week during January and early February. This cruise runs 7-days a week from April 1st - September 30th. This cruise runs 7-days a week from October 1st - November 30th. This cruise runs 7-days a week during February. Public tickets range from $23-$28. A minimum of 8 people is needed in order to launch public cruises. This cruise runs 2.5 hours prior to every Blue Jackets home game. Public cruise tickets range from $22-$32. A minimum of 8 people is needed in order to launch public cruises. Private Trolleys for 15-people range from $265-$435. Additional passengers may be added for $20/person. This cruise runs 2.5 hours prior to every Clippers home game. Public cruise tickets range from $27-$32. A minimum of 8 people is needed in order to launch public cruises. Private Trolleys for 15-people range from $375-$435. Additional passengers may be added for $20/person. This cruise runs the Friday night before all home games. Potential stops include: Varisty Club, Little Bar, Big Bar, Ohio Stadium, Land Grant, Seventh Son, or wherever your group would like to go! Tickets range from $28-$32. Private Trolleys for 15-people range from $379-$449. Additional passengers may be added for $20/person. A minimum of 8 people is needed in order to launch public cruises. The meeting location for the 10am and 11am pick-up is inside North High Brewing - 1288 N High St, Columbus, OH 43201. The meeting location for the 3pm and 4pm pick-up is TBD, but will be a short walk from Muirfield Village Golf Club. Please arrive at least 15 minutes prior. If you arrive early, do not bring alcohol inside of the meeting location. Tickets range from $23/person. Private Trolleys for 15-people are $275. Additional passengers may be added for $20/person. A minimum of 10 people is needed in order to run public transportation.